Secure anything to your walls with full confidence that it will stay put—yes, it's possible! Accomplish this and more when you start with the best tools for finding studs. 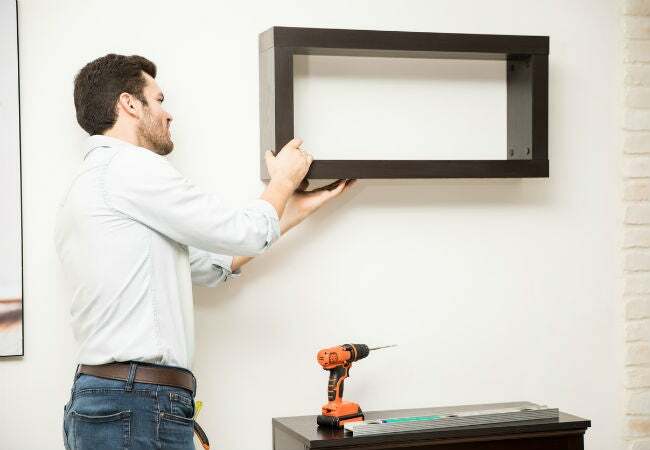 If you’ve ever had to install shelving or hang a heavy mirror on a wall, you’ve probably already gone looking for wall studs once before. It’s an essential first step because attaching a heavy item to drywall alone will eventually lead to everything crashing down in a heap on the floor—or whatever happens to be beneath it. Drywall is not strong enough to hold heavy items, so it’s better to drive nails and screws into the studs behind them. Now, while you can locate wall studs using a few tricks, it’s smart to keep a stud finder in the toolbox because it’s the quickest (and most foolproof) way to do so. Other tricks will lead you to tap nails into the wall where you think you’ll find a stud, but, too often, you’ll end up with a wall full of nail holes before you actually hit the stud. You’ll find a variety of options on the market, from models with the ability to detect more than just studs to others that work with not just walls but floors and ceilings, too. Choosing the best stud finder depends on the type of projects you’re most likely to undertake, so weigh the work you’ll be doing with the following considerations before you select your newest tool. Stud finders fall into two basic categories based on the method they use to detect studs, either magnetic or electronic. One’s not inherently better than the other; rather, each one offers different benefits for different situations. Magnetic stud finders use powerful rare earth magnets to detect the location of metal screws or nails that hold the drywall panels in place. As you slide this type of stud finder over a wall, it is magnetically attracted to any spot directly above a nail or screw—you will actually feel it pulling in that direction, and you may even see the stud finder stick! (Most magnetic stud finders are lightweight and have magnets powerful enough that they will hold through the drywall.) Magnetic stud finders work to a depth of about ¾-inch, which is sufficient most of the time for finding studs behind standard ½-inch or 5/8-inch drywall. When you locate a nail or screw, you’ve located a stud. 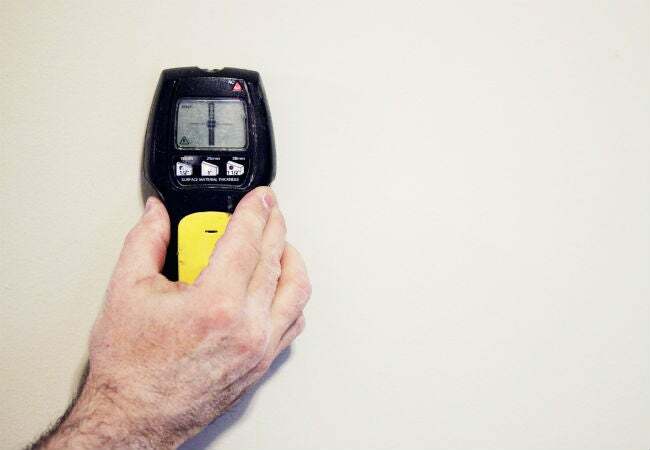 Because drywall fasteners are located typically 12 to 16 inches apart, it’s recommended that you move a magnetic stud finder over the wall in a sweeping “S” motion to more quickly detect one. + Magnetic stud finders are very affordable, often less than $10. + They will pinpoint both wood studs (by their metal fasteners) as well as steel studs, which are used in commercial construction. + They do not need batteries to work. – Because they detect metal instead of the stud, itself, they can pick up any type of metal in the wall—e.g., metal lathe used to secure plaster or a nail in a horizontal cross board instead of a vertical stud—making false positives possible. Electronic stud finders, on the other hand, rely on internal sensors rather than magnets to pinpoint the location of wood studs. They sense a change in density in the space behind the wall. Though the technology may sound complicated, electronic stud finders are easy to use: Simply place the tool flat against the wall and move it slowly in a horizontal fashion. When it detects a stud, it will emit an audible alarm and produce a visual indicator, depending on the specific model. + Electronic stud finders are more precise than magnetic ones. They feature either an LED screen or indicator lights that can pinpoint the edges of a stud and the exact center. + High-quality electronic stud detectors can detect studs located deeper in the wall than what a magnet can detect (up to 1½ inches). – Electronic stud finders cost more than magnetic stud finders, running an average of $25 to $60, depending on how deep the sensors can detect studs or joists. – They require batteries; if the battery runs out and you don’t have extras, you could end up with a non-functioning tool when you need it. Today’s stud finders can also pack an extra punch, outfitted with options you may find beneficial while at work. You won’t find too many of these bells and whistles on magnetic models, though; without an additional source of power, they’re simply incapable of some of the additional features. Cherry-pick which features you think will be most helpful before you go narrowing down the options for best stud finder. • A built-in bubble level, available on either magnetic or electronic stud finder, can assist you in leveling shelves or whatever else you’re attaching to the wall. • A built-in laser (electronic models only) is a step up from a bubble level. At the press of a button, you can shine a laser in a perfectly straight line from the stud you’ve located, either vertically or horizontally to help you align additional fasteners. • Depth adjustment (electronic models only) allows you to switch from detecting studs ¾-inch deep behind drywall to locating any number of objects up to 1½ inches beneath the surface. The ability to inspect further behind the surface is handy for detecting floor joists beneath additional surface coverings like wood, tile, or carpet, but you won’t want to run your electronic stud finder at this level all of the time. Increasing the depth adjustment takes more energy and runs the batteries down more quickly. Switching back and forth and primarily keeping it on stud-finding mode helps conserve battery life. • Electronic stud finders labeled “multipurpose” are designed to detect additional materials within the walls, such as live electrical wires and plastic pipes so that you don’t nail or cut into anything that might be problematic. • A “center punch” feature (electronic models only) makes a small hole in the wall right over the center of a stud, which is the optimal spot for inserting a nail or screw—no need to carry a pencil to mark it. • Varying visual displays (electronic models only) give you some choice in how you want to “see” the stud. Some electronic stud finders let you preview a digital map of the stud beneath the wall on an LED screen, others feature LED lights across the top that blink when the finder is passed over a stud—both provide a reliable way to pinpoint a stud. • A battery indicator (electronic models only) will alert you when it’s time to replace the batteries. • An ergonomic hand grip makes holding and moving the stud finder easier and is available on both magnetic and electronic models. After comparing comprehensive research of customer reviews and ratings to some of the key shopping considerations we’ve outlined above, we’ve narrowed the market to three top picks. 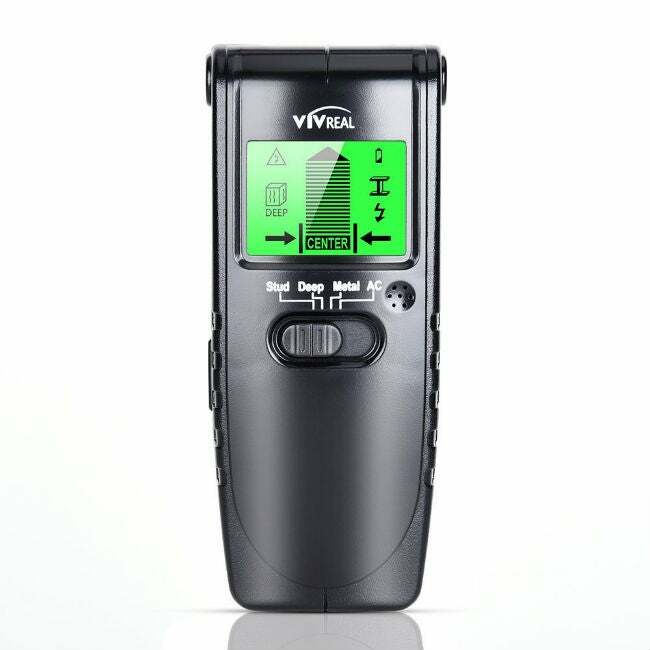 Start your shopping here to find the best stud finders for any skill level and project. Based on independent testing, The Wirecutter recommends the C.H. 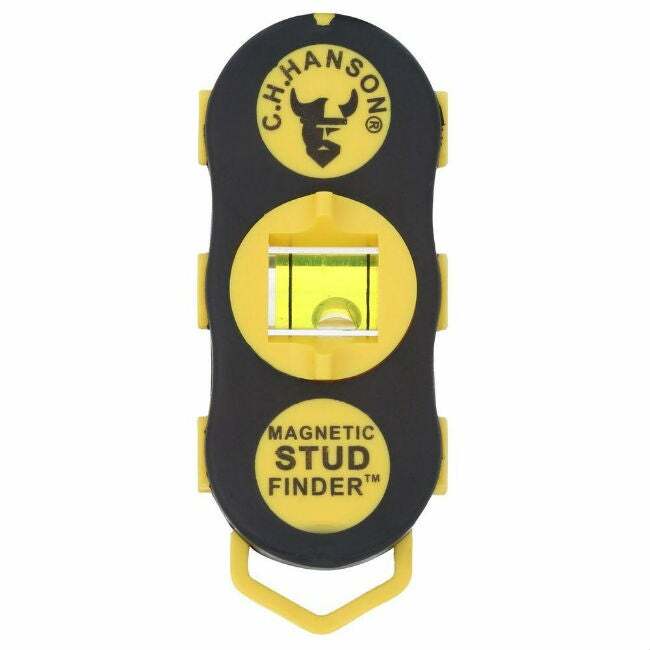 Hanson Magnetic Stud Finder as the best magnetic stud finder for most people. And consumer reviews don’t lie: Home Depot buyers rate this little stud finder 4.7 out of 5 stars, citing its ease of use and its strong adherence to the wall when it locates a nail. While some magnetic stud finders have only one magnet, the C.H. Hanson model features two (one at each end)—a simple design tweak that doubles its scanning area and shortens the amount of time it takes to locate the nails or screws in a stud up to ¾-inch deep. Its soft ergonomic grip makes it comfortable to hold, and its built-in bubble level makes the next steps in mounting something on your wall a snap. When it’s done its job, slip the mini stud finder (only about three inches long and one-and-a-quarter inches wide) into a shirt pocket until you’re back at your toolbox. Includes a 1-year warranty against material defects. Available from Home Depot. For its ability to pinpoint wood and metal studs as well as copper or steel pipes and electric wires, the Vivreal Multifunction Wall Detector was Popular Mechanics‘ pick for “Best Technology.” Amazon buyers agree, rating the Vivreal 4.7 stars out of five stars for its easy-to-read LED display and its effectiveness. If you’re an ambitious do-it-yourselfer with big dreams for your walls, the compact, 6½-inch by 2-3/8-inch electronic stud finder would be a great choice. Vivreal offers both visual cues on its LED screen and audible alerts to tell you when you pass over a stud, a pipe, or wiring, and it can pinpoint the exact center of the stud so you won’t have to guess when hanging a heavy mirror or a planter. Switch to its deep scanning mode to look for metal pipes or wiring that lie within 1½ inches beneath the surface of the wall. All it takes is a 9-volt battery (which the stud finder will remind you to change as it gets low). It comes with a 1-year limited warranty. Available from Amazon. For precision and a wide field of detection, the ProSensor 710 was The Spruce‘s choice for “Best Overall Stud Finder.” The key to the ProSensor’s success is a line of tiny red LED lights along the top of the tool. When passed over a stud, only the bulbs directly over the stud light up, alerting the carpenter to its exact location. Because the lights extend all the way across the top of the 7-inch-long tool, the ProSensor can detect studs that are within a few inches of one another, which is often the case near a door or the corner of a wall. It picks up both wood and metal studs and can detect pipes and wires to a depth of 1½ inches. It doesn’t come with an audible alert, but buyers don’t seem to mind—Amazon reviews still rate it 4.5 out of five stars. 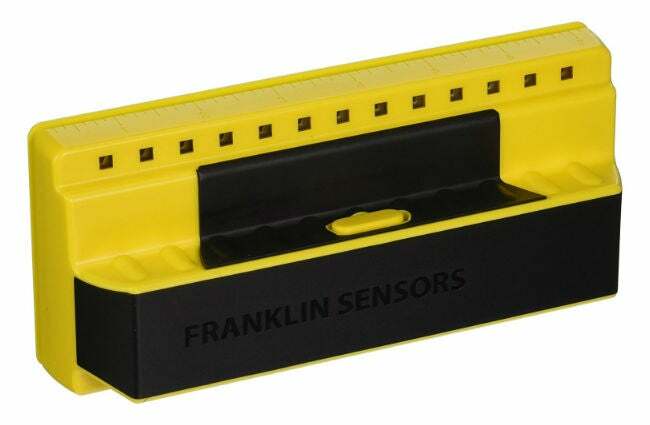 While the battery-powered ProSensor is a good stud finder for anyone, its accuracy and wide detection field make it a great find for those in the construction industry. It comes with a 1-year limited warranty. Available on Amazon.